As a leading provider of network equipment for SMBs, NETGEAR continues to lead the networking industry with its 2nd Generation of ProSAFE 10-Gigabit Web Managed (Plus) Switches. 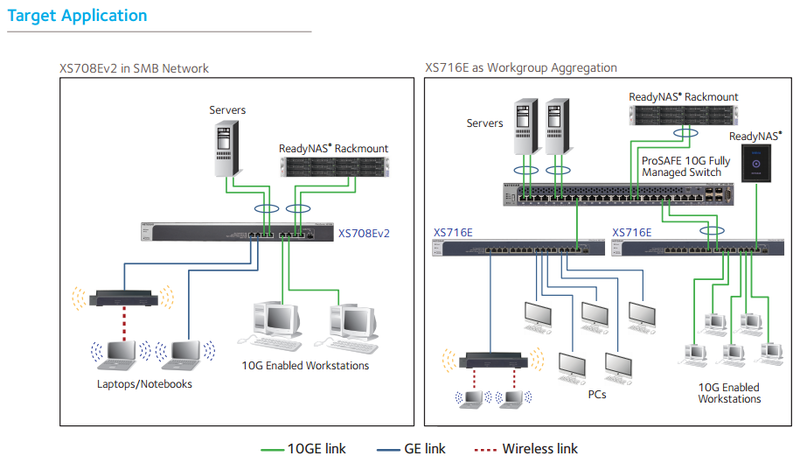 The XS708Ev2 and XS716E are the market’s most cost efficient 10-Gigabit switches. Built for SMBs, workgroups, and even home offices, the XS708Ev2 provides 8 (eight) 10-Gigabit Copper ports and 1 Shared (Combo) Copper/SFP+ fiber port, while the XS716E provides 16 (sixteen) 10-Gigabit Copper ports and 1 Shared (Combo) Copper/SFP+ fiber port, all at an affordable price. The XS708Ev2 and XS716E are ideal switches for SMBs in need of simple and affordable 10-Gigabit Ethernet connectivity into their 10G-capable servers and storage devices. Either can be used at the “center of a small business or home office network” or as an aggregation/access switch in a larger organization, connecting to a 10-Gigabit NETGEAR ProSAFE Fully Managed Switch on one end and extending the 10G connections to the edge. They are also ideal for smaller workgroups that need high bandwidth for sharing, collaborating, editing, and publishing high-density content like video or animation. Customers can use Cat6 or Cat7 copper cables with standard RJ45 Ethernet jacks that are already widely used in their current network. Network speeds can improve up to 10x going from traditional Gigabit to 10-Gigabit with minimal network changes and upgrades. 10GBASE-T allows a standard RJ45 Ethernet jack and existing Cat 6 or Cat 7 network cables to be used, delivering a 10X increase in network performance with minimum changes/upgrades. 10GBASE-T Copper Ethernet connections Support low-latency, line-rate 10G Copper “BASE-T” technology with backward compatibility to Fast Ethernet and Gigabit Ethernet. Cost-effectively migrate current network to 10G capacity by utilizing the existing Cat 6 RJ45 short connections (up to 45m) and Cat 6a/Cat 7 connections up to 100m. Port trunking / Link Aggregation (Static Manual LAGs) Build up bigger bandwidth to support aggregated uplink/downlink traffic or to provide redundant link(s) using Static Manual LAGs. ** The NETGEAR OnCall 24x7 contract provides unlimited phone and email technical support for your networking product. For ProSAFE products purchased prior to 06/2014, also includes Next-Business-Day (NBD) hardware replacement. Download the NETGEAR XS708Ev2 and XS716E Datasheet (PDF).